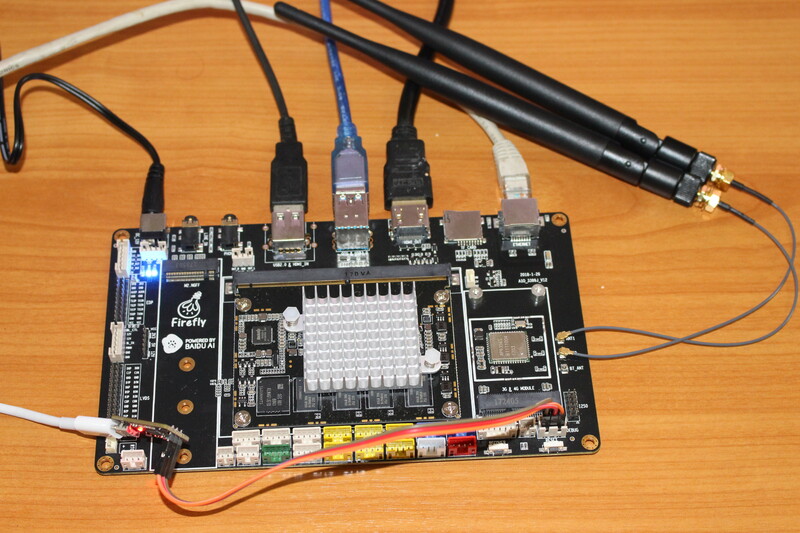 Regular readers will know that Firefly team sent me several of their Rockchip boards for evaluation, and I started with a review of ROC-RK3328-CC development board powered by Rockchip RK3328 processor. This time, I went with the high-end AIO-3399J board comprised of a features-packed baseboard and a Rockchip RK3399 system-on-module. Just like with the previous review, I’ve decided to focus on Linux support, in this case Xunbuntu 16.04, and I’ll do an Android review on the company releases Android 8.1 for Firefly-RK3399 board. Before booting the board, I inserted the heatsink, and connected the provided WiFi antennas. 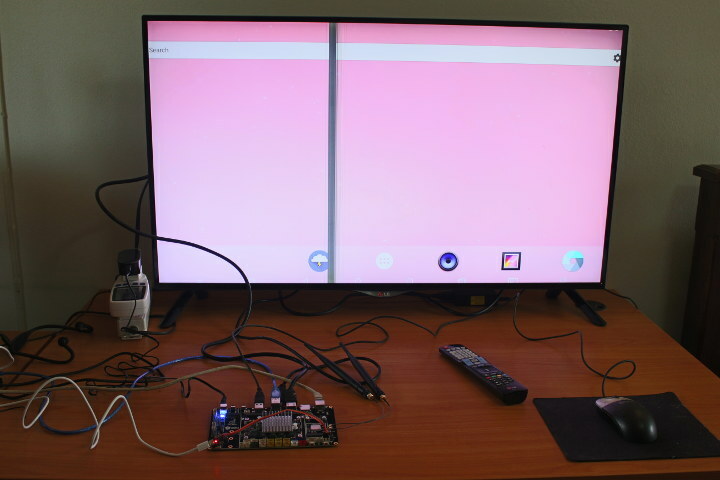 I also connected some devices and cables, including a mouse, the male to male USB cable to the top USB 3.0 (OTG) port for firmware update, a HDMI cable to my TV, and Ethernet cable, as well as the serial debug board. The final step was to connect the 12V power supply, and I immediately got output to the serial console (/dev/ttyUSB0 configured with 1,500,000 bps 8N1, no hardware flow control), and a few seconds later the Android 7.1 launcher showed up. But I wanted to run a Linux distributions, so I went over the download page, and selected the latest Ubuntu 16.04 image (AIO-3399J_xubuntu1604_20180119.7z), which actually happens to be Xubuntu 16.04 (Ubuntu + Xfce desktop environment). Just make sure you select “Google Drive” instead of “Official” if you are outside of China, as the download speed should be much higher that way. Now that we have out firmware file, we just need to follow the upgrade instructions for Linux or Windows with respectively Linux_Upgrade_Tool or AndroidTool. My computer is running Ubuntu 18.04, so I went with the Linux method. First you need to make you’ve connected your male to male USB cable between your computer and the board with power connected. We need to enter “loader mode” as follows: keep pressing the recovery button, press and release the reset button, and about two seconds later, release the recovery button. DDR Version 1.08 20170320 In Channel 0: DDR3, 800MHz Bus Width=32 Col=10 Bank=8 Row=15 CS=1 Die Bus-Width=16 Size=1024MB Channel 1: DDR3, 800MHz Bus Width=32 Col=10 Bank=8 Row=15 CS=1 Die Bus-Width=16 Size=1024MB 256B stride ch 0 ddrconfig = 0x101, ddrsize = 0x20 ch 1 ddrconfig = 0x101, ddrsize = 0x20 pmugrf_os_reg = 0x32817281, stride = 0x9 OUT Boot1: 2017-06-09, version: 1.09 CPUId = 0x0 ChipType = 0x10, 1836 SdmmcInit=2 0 BootCapSize=100000 UserCapSize=14910MB FwPartOffset=2000 , 100000 SdmmcInit=0 20 StorageInit ok = 66829 LoadTrustBL No find bl30.bin Load uboot, ReadLba = 2000 Load OK, addr=0x200000, size=0x77d6c RunBL31 0x10000 NOTICE: BL31: v1.3(debug):9f93abc NOTICE: BL31: Built : 10:18:20, Jul 27 2017 NOTICE: BL31: Rockchip release version: v1.1 INFO: GICv3 with legacy support detected. ARM GICV3 driver initialized in EL3 INFO: plat_rockchip_pmu_init(1089): pd status 3e INFO: BL31: Initializing runtime services INFO: BL31: Initializing BL32 INF [0x0] TEE-CORE:init_primary_helper:337: Initializing (1.1.0-96-g3fbe315-dev) INF [0x0] TEE-CORE:init_primary_helper:338: Release version: 1.1 INF [0x0] TEE-CORE:init_teecore:83: teecore inits done INFO: BL31: Preparing for EL3 exit to normal world INFO: Entry point address = 0x200000 INFO: SPSR = 0x3c9 U-Boot 2014.10-RK3399-06 (Mar 13 2018 - 09:22:52) CPU: rk3399 cpu version = 0 CPU's clock information: aplll = 816000000HZ apllb = 24000000HZ gpll = 800000000HZ aclk_periph_h = 133333333HZ, hclk_periph_h = 66666666HZ, pclk_peZ aclk_periph_l0 = 100000000HZ, hclk_periph_l0 = 100000000HZ, pclkZ hclk_periph_l1 = 100000000HZ, pclk_periph_l1 = 50000000HZ cpll = 800000000HZ dpll = 800000000HZ vpll = 24000000HZ npll = 24000000HZ ppll = 676000000HZ Board: Rockchip platform Board Uboot as second level loader DRAM: Found dram banks: 1 Adding bank:0000000000200000(000000007fe00000) Reserve memory for trust os. dram reserve bank: base = 0x08400000, size = 0x01000000 128 MiB SdmmcInit = 0 20 storage init OK! Using default environment GetParam remotectl v0.1 pwm freq=0xb8320 pwm_freq_nstime=0x52d Load FDT from resource image. power key: bank-0 pin-5 can't find dts node for fixed usb bc: can find node by path: /dwc-control-usb/usb_bc pmic:rk808 can't find dts node for pwm1 set pwm voltage ok,pwm_id =2 vol=1000000,pwm_value=66 CPU's clock information: aplll = 816000000HZ apllb = 24000000HZ gpll = 800000000HZ aclk_periph_h = 133333333HZ, hclk_periph_h = 66666666HZ, pclk_peZ aclk_periph_l0 = 100000000HZ, hclk_periph_l0 = 100000000HZ, pclkZ hclk_periph_l1 = 100000000HZ, pclk_periph_l1 = 50000000HZ cpll = 800000000HZ dpll = 800000000HZ vpll = 24000000HZ npll = 24000000HZ ppll = 676000000HZ SecureBootEn = 0, SecureBootLock = 0 #Boot ver: 2018-03-13#1.09 empty serial no. normal boot. checkKey vbus = 1 rockusb key pressed. Loading firmware... Support Type:RK330C FW Ver:6.0.01 FW Time:2018-01-19 11:39:11 Loader ver:1.05 Loader Time:2017-04-25 15:10:44 Upgrade firmware ok. The board will be automatically reboot, and Xubuntu desktop should show on your HDMI TV/monitor after a few seconds. I then remove the male to male USB cable, and instead added a USB keyboard, and a USB 3.0 drive. You may notice I had some overscan issues (edges cut) in the photo above, but setting aspect ratio to “Just Scan” in my LG television fixed the issue. [ 0.001393] Yama: becoming mindful. [ 0.136102] SMP: Total of 6 processors activated. [ 0.161752] hw-breakpoint: found 6 breakpoint and 4 watchpoint registers. [ 0.283606] Advanced Linux Sound Architecture Driver Initialized. [ 0.344725] RPC: Registered named UNIX socket transport module. [ 0.345263] RPC: Registered udp transport module. [ 0.345679] RPC: Registered tcp transport module. [ 0.346104] RPC: Registered tcp NFSv4.1 backchannel transport module. [ 0.363833] Installing knfsd (copyright (C) 1996 okir@monad.swb.de). 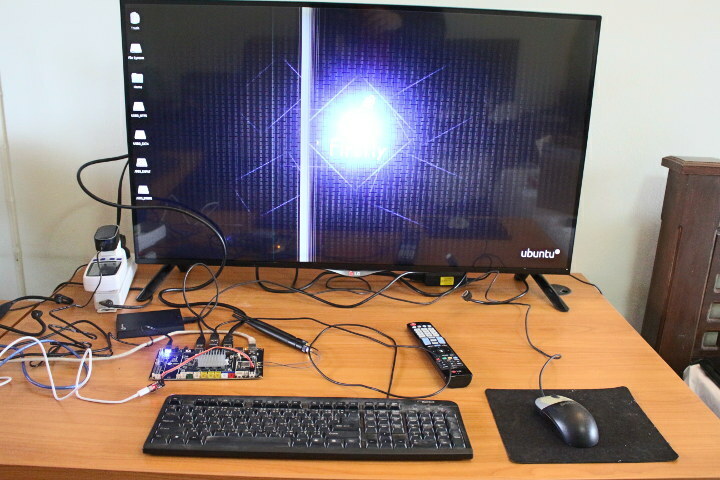 [ 0.927003] rockchip-pcie f8000000.pcie: PCIe link training gen1 timeout! [ 0.961085] [drm:drm_vblank_init] Supports vblank timestamp caching Rev 2 (2. [ 0.961787] [drm:drm_vblank_init] No driver support for vblank timestamp que. [ 1.722138] rk_gmac-dwmac fe300000.ethernet: clock input or output? (input). [ 1.722761] rk_gmac-dwmac fe300000.ethernet: TX delay(0x28). [ 1.723272] rk_gmac-dwmac fe300000.ethernet: RX delay(0x1b). [ 2.028034] fan53555-regulator 0-0040: FAN53555 Option Rev Detected! [ 2.031739] fan53555-regulator 0-0041: FAN53555 Option Rev Detected! [ 2.091266] dwmmc_rockchip fe310000.dwmmc: IDMAC supports 32-bit address mod. [ 2.091937] dwmmc_rockchip fe310000.dwmmc: Using internal DMA controller. [ 2.093989] dwmmc_rockchip fe310000.dwmmc: 'clock-freq-min-max' property was. [ 2.097362] dwmmc_rockchip fe320000.dwmmc: IDMAC supports 32-bit address mod. [ 2.098033] dwmmc_rockchip fe320000.dwmmc: Using internal DMA controller. [ 2.100057] dwmmc_rockchip fe320000.dwmmc: 'clock-freq-min-max' property was. [ 2.178255] Netfilter messages via NETLINK v0.30. [ 2.179588] ctnetlink v0.93: registering with nfnetlink. [ 2.182992] IPVS: ipvs loaded. [ 2.190601] bridge: automatic filtering via arp/ip/ip6tables has been deprec. [ 2.197051] [WLAN_RFKILL]: wlan_platdata_parse_dt: enable wifi power control. [ 2.197684] [WLAN_RFKILL]: wlan_platdata_parse_dt: wifi power controled by g.
[ 2.198420] [WLAN_RFKILL]: wlan_platdata_parse_dt: get property: WIFI,host_w. [ 2.201475] [BT_RFKILL]: bluetooth_platdata_parse_dt: get property: uart_rts. [ 2.202376] [BT_RFKILL]: bluetooth_platdata_parse_dt: get property: BT,reset. [ 2.203139] [BT_RFKILL]: bluetooth_platdata_parse_dt: get property: BT,wake_. [ 2.203861] [BT_RFKILL]: bluetooth_platdata_parse_dt: get property: BT,wake_. [ 2.207062] [BT_RFKILL]: bt_default device registered. [ 2.212956] I : [File] : drivers/gpu/arm/midgard_for_linux/backend/gpu/mali_. [ 2.236145] usb usb6: We don't know the algorithms for LPM for this host, di. [ 2.255613] usb usb8: We don't know the algorithms for LPM for this host, di. [ 2.261165] dwmmc_rockchip fe310000.dwmmc: IDMAC supports 32-bit address mod. [ 2.261830] dwmmc_rockchip fe310000.dwmmc: Using internal DMA controller. [ 2.263855] dwmmc_rockchip fe310000.dwmmc: 'clock-freq-min-max' property was. [ 2.307684] Realtek 8188EU USB WiFi driver (Powered by Rockchip,Ver 2.20.WFD. [ 2.335030] VFS: Mounted root (ext4 filesystem) on device 179:6. [ 2.411355] systemd: Detected architecture arm64. [ 2.414088] systemd: Set hostname to . [ 2.521018] mmc2:mmc host rescan start! [ 2.558674] systemd: Reached target User and Group Name Lookups. [ 2.559811] systemd: Listening on /dev/initctl Compatibility Named Pipe. [ 2.560948] systemd: Listening on Journal Socket. [ 2.561956] systemd: Started Forward Password Requests to Wall Directory . [ 2.563036] systemd: Reached target Remote File Systems (Pre). [ 2.564174] systemd: Listening on Journal Socket (/dev/log). [ 2.569803] systemd: Reached target Encrypted Volumes. [ 2.570546] systemd: Reached target Remote File Systems. [ 2.571577] systemd: Listening on Syslog Socket. [ 2.572701] systemd: Created slice User and Session Slice. [ 2.573467] systemd: Reached target Swap. [ 2.574358] systemd: Listening on udev Control Socket. [ 2.575866] systemd: Listening on udev Kernel Socket. [ 2.577062] systemd: Created slice System Slice. [ 2.580444] systemd: Created slice system-serial\x2dgetty.slice. [ 2.605593] systemd: Reached target Slices. [ 2.618610] systemd: Started Remount Root and Kernel File Systems. [ 2.625619] systemd: Mounted POSIX Message Queue File System. [ 2.628435] systemd: Failed to start Load Kernel Modules. [ 2.629799] systemd: systemd-modules-load.service: Unit entered failed st.
[ 2.631278] systemd: systemd-modules-load.service: Failed with result 'ex. [ 2.632546] systemd: Mounted Debug File System.